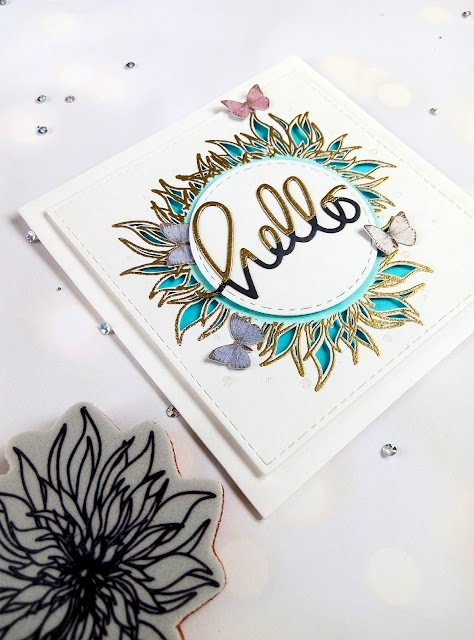 Olesya's here with a h-e-l-l-o card :) You know, most of So Suzy stamps are super versatile and can be used in absolutely different themes and designs. Here I used Wispy Chrysanthemum outline stamp to make some abstract rays or smth like that. But imagine how cool it would be as a sun or whimsical grass ... Sky's the limit to your imagination! I prepared some more pics and process steps for you. So if you are interested, welcome to my blog. Thank you so mych for stopping by! Have an inspiring day!